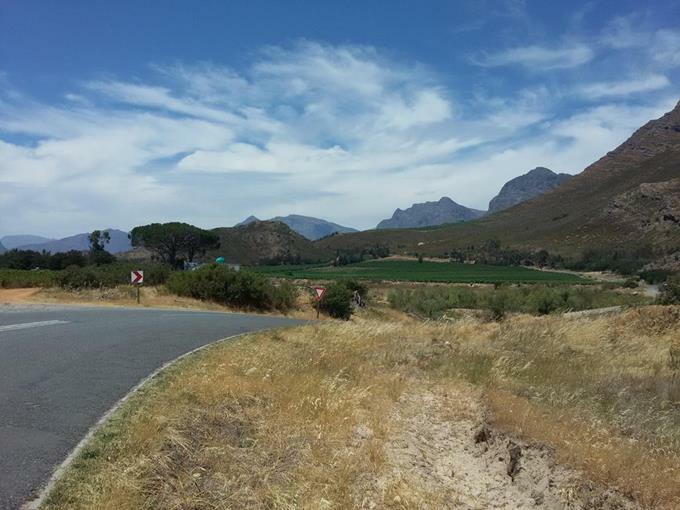 With temperatures forecast to be in the upper thirties Celsius, there was a distinct sense among the riders gathering at Vrede wines that even a 3am start was not early enough. That wasn’t the only drama of the ride either, Theunis notching up three different mechanicals before we’d reached halfway: a broken rear spoke; a broken seatpost clamp; and a broken saddle bag. The last of those was fixed in true Audax fashion, courtesy of cable ties supplied by riding companion and friend Henri Meier. The seat post clamp was an altogether trickier problem. Only noticed as we stopped for breakfast in Slanghoek, our initial debate on the matter suggested it might be a ride-ending failure. If we’d noticed the issue on our unexpected detour through Worcester, we could have visited a bike shop. We did briefly contemplate backtracking the 15km or so, but in truth no one was enthused with the idea. And then, from thin air, came the notion that maybe an irrigation hose clamp could be used. I forget who had the idea, but perhaps sitting next to a sprinkler watering the flower beds triggered the inspiration. Even more miraculous was that Theunis found a friendly farm foreman who had one of the right size, and it did actually do the job. By now though, his Specialized Roubaix was beginning to look something short of it’s stylish best. As predicted, the temperature began to rise steadily on our way to the start of Bains Kloof, becoming truly ferocious by the time we started the climb. There was not the slightest breath of breeze to cool us down, and dousing arm protectors and bandannas had little effect – they just dried out in seconds. Worse still, the tarmac of the rising road ahead acted like a reflector, magnifying the heat before directing it straight back into our faces. A climb which I’d normally count among my favourites became a slow torturous slog up from the fires of hell. I was surprised how revived I felt by the time we reached the Wellington control – the descent had still been stiflingly hot, but it had refreshed just enough to lift the spirits. I ate and drank well, or at least I thought I did. But, in hindsight, we’d pushed hard to get to the 200km mark in an elapsed time of 10 hours, with diversions and stops not far short of 2 hours. And I was too eager to get back on the road to notice that more rest and recovery was needed. Just as with the Joburg 600km Audax in February 2014, I paid the price for not listening to what my body needed. We hadn’t even traveled 10km beyond Wellington before the trouble set in. Henri managed to escape some of the savage heat by pedaling fast enough to generate his own breeze. As hard as I tried to do the same, the body just refused to respond. The full heat of the day bore down upon Theunis and I as we laboured along the dry, dusty haze of a road to Hermon. Even the countryside conspired against us – with barely a patch of green in sight, the shades of gold and brown from the fields either side only seemed to intensify the heat. Sips of water or bites of snack had no effect at all, save to make me feel bloated – the needed hydration and energy just didn’t come, at least not fast enough anyhow. My spirits faded, and I suggested to Theunis maybe we should find some shade and stop for a while. The stand of trees we pulled over at were sparse, but the faint shadow they cast did at least keep off the burning rays of sun. They did nothing to diminish the heat though, and as we sat there slumped against the trunks of neighbouring trees it became clear our choices were limited: wait for a couple of hours until the heat died down; or accept a DNF and call for help. Perhaps if the ride had the urgency of say a PBP qualifier, we’d have sat things out – with our pace so far, we certainly had ample time in the bank. But without such motivation, the latter option was all too easy to take. Thankfully our good friend Hendrik Vermaak was not only available, but actually seemed rather flattered to be called out as our knight in shining Pajero. The least we could do was buy him some decent beer and pizza at Wild Clover (handily opposite our cars at Vrede wines) to say thanks for rescuing us. Sitting enjoying the company of good friends as the afternoon gradually cooled, it wasn’t possible to even feel that disappointed. OK, we hadn’t finished, and a DNF never feels great. But we had ridden 210km on one of the hottest days of the year so far. And, as always, there are more lessons to be learned from a failed ride than a successful one. In this case it’s clear that, whilst my ability to ride in heat has improved significantly, I still have work to do – especially at spotting the danger signs before they become ride ending. The official Audax SA ride report can be found here.